It might not be in a setting as idyllic as Ibiza, but the sight of Nagai tucked at the end of a nondescript shopping arena is like an oasis for a forlorn traveller parched in a desert. Especially after the gruelling two-hour drive in the peak of Delhi’s humid monsoon. The decor is quintessentially minimalist. Dull grey, earthy greens and whites juxtaposed with bamboo wall hangings and wooden panels remind us of the humble lodgings in the little hamlets of Japan. We notice the play of gold and copper in the furniture and crockery, very artisanal in their appearance. The large geisha drawings on the walls are the handiwork of the Irish artist Fin Dac. 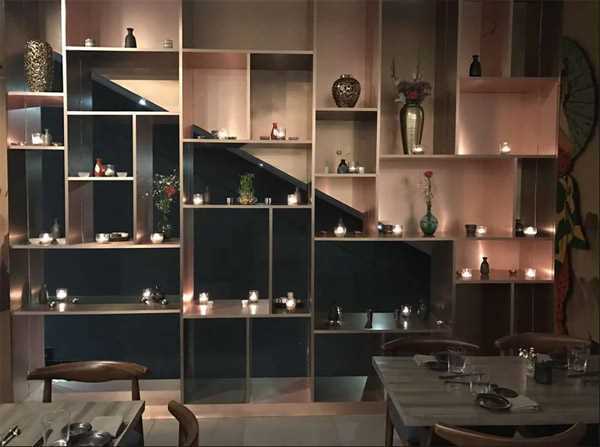 Nagai, the Japanese word for longevity, after flooring gourmands in the Balearic Islands of Spain, has been brought to India by chefs Reina Nagai and Eleonora in partnership with Akshay Mohan, a pilot by profession with a keen palate and an acumen for the food business. Connoisseurs of fine-dining can also sample a host of imported sake and sochu. The menu at Nagai is interesting (essentially Japanese with signature dishes that reflect Thai, Mediterranean and Mexican influences) and showcases chef Reina and Eleonora’s penchant for new adventures. Brought up amidst traditional flavours and aromas in her father’s restaurant in Japan, as a young lady the chef embarked on a self-exploration trip to America, Canada and Italy. She tried her hand at several adventures and eventually settled down in Ibiza opening Nagai. She has been working with Eleonora for over 12 years. Eleonora travelled from Italy to India and Thailand many moons ago and delighted in the way of life, culture and food. She grew up in restaurants and clubs in Rome. Being vegan and then pescatarian, she’s found ways to eat and cook healthily as well as tastily. Nagai at Ibiza is her fourth restaurant after her first one in Koh Phangan and two in Rome. This brings us to what we are here for — the food. Selecting from a carefully curated chef’s tasting menu, we start off with a tofu miso soup and a chicken tom yum soup. While the miso soup is almost like a light and flavourful palate cleanser, the tom yum is aromatic and tangy. Next up is the kushiyaki chicken skewers served with teriyaki sauce. It’s juicy and grilled to perfection. We are intrigued by the mini aubergine skewers that come with a mustard miso sauce. What we discover after biting into the pan-seared morsels of aubergine is that they actually are a Japanese take on the native Bengali delicacy — brinjal fry. The sauce gives it a delish twist though. 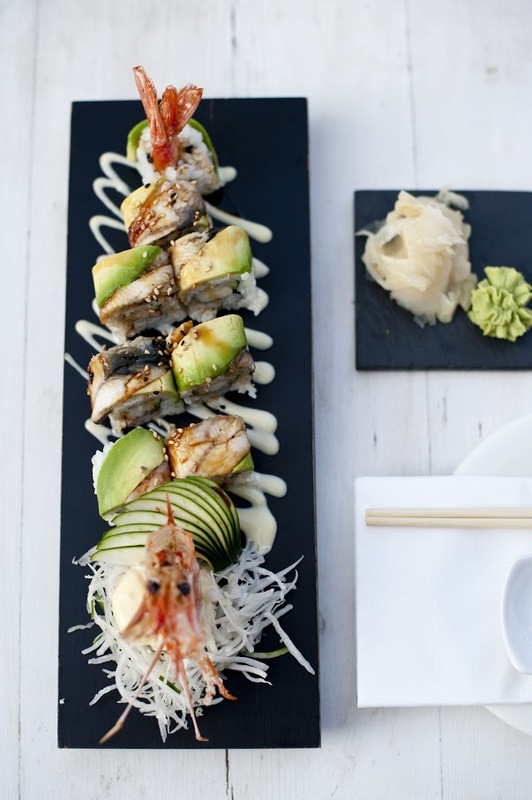 A Japanese meal is synonymous with sushi and sashimi and the menu has quite some variety. While my friend opts for the signature king prawn dragon roll, I stick to the harmless crispy avocado and baby corn sushi. Vegetarian sushi can be delectable too, as I learn after biting into my avocado. The fruit and the crispy baby corn come beautifully together with the soft rice, with the walnut garnish leaving a nutty aftertaste in the mouth. My friend finds orgasmic delight in the prawn roll as she feels the play of textures: the crispy top, the soft middle layer of rice and the prawn in the centre offering a crunch as the sushi melts in her mouth. Almost stuffed by now, we order our main courses for the evening. Nagai fried rice and yaki udon (Japanese style noodles) it is. Tossed with Reina’s special spice mix, the rice leaves us disappointed because of the overpowering taste of carrots. Though the vegies are delicately cut to resemble noodles themselves, the plating could be more inventive. 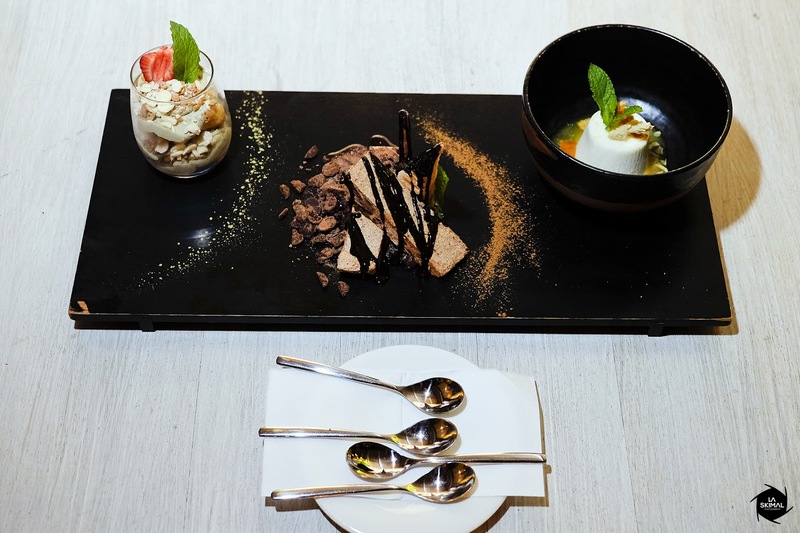 While the amiable server offers to get another helping to suit our taste, we decline it politely as our tummies have just enough space to fit in the desserts, which are on point. The dark chocolate semifreddo is a joyous amalgamation of a creamy mash, chocolate bits, and cinnamon. 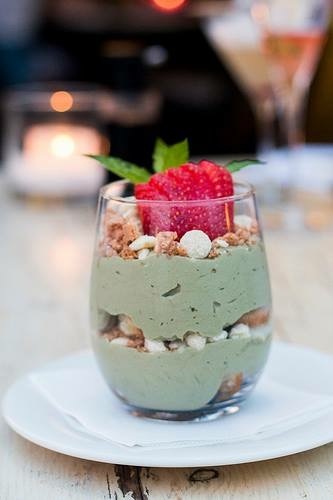 The matcha green tea tiramisu fills the palate with a distinct hint of tea. It is soft, delicate and wonderful.